It was the last year they would all be at the same educational institution – elementary bliss from fifth, to third, and down to kindergarten and preschool. My oldest rode in the passenger seat, nearing 11 years old, this his fifth-grade year. In that one moment, the changes I had seen and was moderately prepared for began happening. Other wiser parents who have gone before me have shared that the growth and maturation from boy to man take off in full speed, I should hang on and try to savor the time. While I wasn’t overly convinced that the days would start ticking by, I did recognize that the shift from mom of ‘littles’ to mom of bigger kids would be difficult for me. This particular son was practically glued to me for the first five years of his life. He came into this world with some kind of fierce high level of need that I was unprepared for. While still in the hospital, day two, the screaming along with frenzied, desperate 60-minute long nursing sessions began. The first few years were a blur as I did everything I could to meet his incredibly high needs, taking flack from close family along the way. It was the only thing I could do to survive. Attachment parenting, the family bed, snuggle time, nary a babysitter would suffice. After a year, he finally started going to daddy without giving him too much grief. And here this child was just ten years later, careening into adolescence, rebuffing me like some stranger. Although I had tried to anticipate what things might look like as he grew, nothing would prepare me for the first time my child no longer needed my hug goodbye. Or my kisses. While he was fine with affection in private, and still is on occasion, I shed a few tears that morning all the while knowing it was just the beginning of what would be a downward (okay downward for me) trajectory into manhood. Some moms seem to have an easier time with older kids, some with younger. Either way, allowing your children to grow and separate—both in their physicalness and in their hearts—is so vital. And so very difficult. I didn’t have a brother, so I lean on my husband to help me notice the cues and prepare in advance. If it were up to me, I would hold and snuggle forever; my husband gently reminds me that I have to start giving space, start letting go, not smother-how is this even possible? We were blessed with two sets, four kids, roughly two and a half years between all four of them-boy, girl, boy, girl. So this means that I have large chunks of time between the same phase for each gender. Now, my next boy is at the same age my oldest was in fifth grade and having just turned 11. I feel the same emotions yet again, perhaps with more sadness this time around. He is growing too fast. I can see the young man yearning inside to come out. I remember the signs and symptoms. I’m not quite as cool as I used to be in the eyes of my son. We are entering a new phase where I must hold less tightly. It feels hard and I don’t want to let go. I want to snuggle indefinitely. Selfishly, I don’t want things to change. We mothers have no choice here, however. One of the craziest things about raising a family is that we adults undergo subtle emotional change, and virtually no physical change, over the many years of child raising; meanwhile, our children transform from seven-pound babies who rely on us for exactly everything to ultimately independent adults (or so I’m told). How are we mothers supposed to do this? It does not feel even remotely possible. And so as my oldest nears the half-way mark of his high school career at 16, my younger son is jumping to lightspeed right before my very eyes. I can feel the change, I know it’s coming. 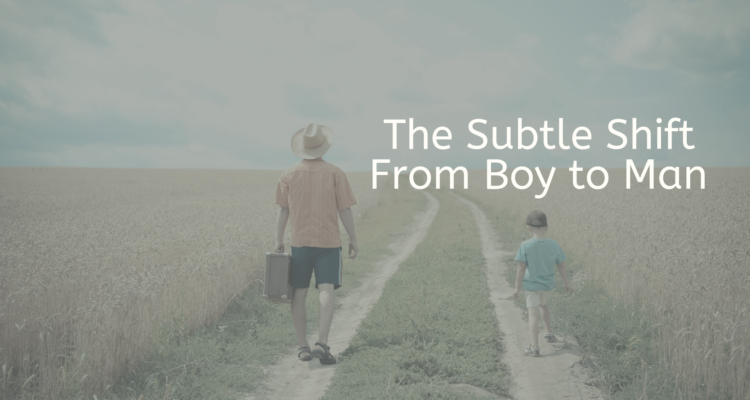 The transformation from boy to man is certainly a journey, but it happens in the subtle shifts along the way. Instead of going in for the hug goodbye in the school drop-off line, I find other times to hug him. I don’t push the questions about how school day was while he’s walking with his friends. I make sure not to press him on emotional issues in front of his siblings. I’m learning, albeit slowly. I have made tons of mistakes with the first son that I’m not repeating with the second. Yet, I’ll make more for sure. That’s just how parenting goes. In my early 20s, before starting a family, I thought about the children I might have one day. I never guessed how fiercely I would love my boys for their endearing sweetness, for the way we have bonded, for the joy, for the fun in being silly and boisterous. I’m honored when one of my sons asks me to throw the football, or play a game, or jump in the pool. I will always provide hugs, walks, deep talks, and advice if asked. I will always require push-ups (and/or extra vegetables) when they burp at the dinner table. As the saying goes, “There has never been, nor will there ever be, anything quite so special as the love between a mother and son” (source unknown). All I know is that I’m a better person for having attempted to love them well and to learn to let them grow out of their need for me. Teared up at this. Grandmothers feel this way too...especially when they live far away. You are such a beautiful conveyor of these feelings. Every mother can relate.